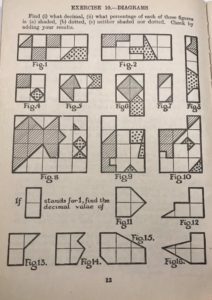 The page of interest (for our purposes) begins by showing a series of irregular shapes dissected into halves, quarters and eighths in a variety of exotic ways. 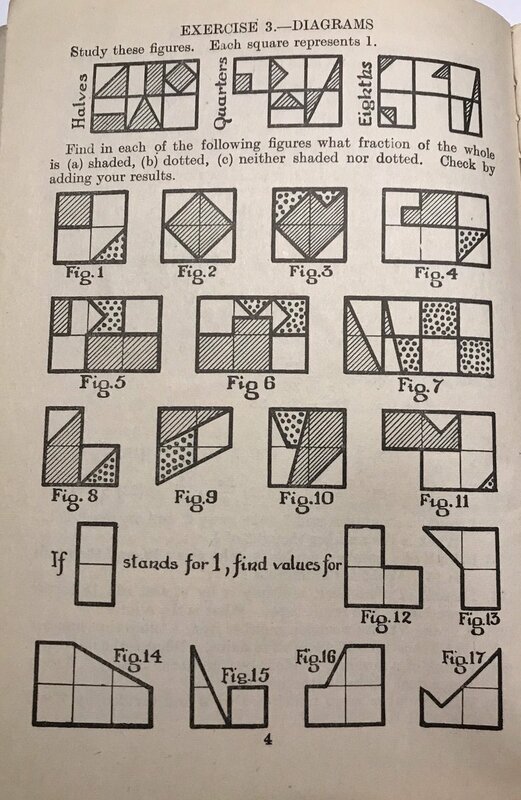 (Actually, he goes a step further by sectioning a large shape into smaller, square “unit shapes” to show the halving, quartering, and eighth-ing). Jo also posts a similar activity from the textbook that asks about percentage. 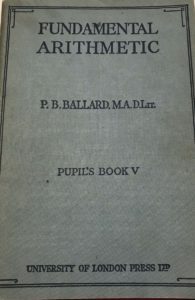 This book (and no doubt several others from yesteryear) serve as a homage to classrooms past. Further, it illustrates that creative resources have existed for centuries, but it is the environment in which we work with them that turns their potential into learning. Michelle Rinehart starts Gr. 6-12 workshop day with a Fraction Talk. Amber Thienel sees Fraction Talks as perfect class starters. Joseph Marquis uses Fraction Talks with tablets and ExplainEverything app. Bryan Penfound details Fraction Talks for Grade 7/8 concepts, and gives a downloadable template. Simon Gregg includes Fraction Talks alongside other great numeracy routines. Fred Harwood links to .pdf sheets to get you started using Fraction Talks. Trish Kepler uses a Fraction Talk handout to encourage number sentence reasoning. Amie Albrecht scaffolds Fraction Talks with this pre-service teacher handout. Simon Gregg shows us how to build our own Fraction Talks with Geogebra. David Petro builds a dynamic websketch as a source of possible Fraction Talk images. Erick Lee neatly combines Fraction Talks with Clothesline Math for a PD with MS teachers. Gizmos‘ Fraction Artist activity allows experimentation with halving and thirding. Trish Kepler uses these flags & this fraction talk handout with Grade 2s. Scholastic has a design task theme in this primary grade lesson plan. Amie Albrecht gives a breakdown of her students’ varied reasoning. Marie Brigham uses this handout with a focus on encountering and sharing multiple perspectives. Jamie Duncan uses Fraction Talks in 1st grade with amazing results. Cindy Whitehead brings design challenges to Desmos activity builder. Tamara DeFord uses Fraction Talk Number Line materials within Number Talk book study. Jenna Laib enacts Fraction Talk Clotheslines with emphasis on formative assessment and 5 practices. Fran Yang uses a sheet with 9 Fraction Talk images to encourage thinking about equivalency. Chase Orton gives a detailed summary of a lesson trajectory using Fraction Talks in 3rd grade. Marie Brigham plays Fraction Talk War with her fourth graders. (video). Martin Joyce uses a pattern block Fraction Talk as a class warm-up. Alison Hansel uses Desmos Activity builder (with sketch and card sort) to digitize Fraction Talks. Kyle Pearce has students use cut-out shapes to cover pieces of Fraction Talk images. Marie Brigham designs a Fraction Talk in Desmos Activity builder for her Gr 4s. Matthew Oldridge merges Fraction Talk images with Desmos sketch and match features. Simon Gregg collects Number Search images where one section is labeled the “whole”.